If you're looking for an entry level juicer, look no further than the Philips HR1851. 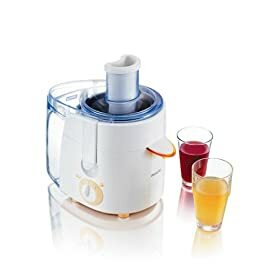 This attractive juicer from Philips comes in white plastic and has a powerful 500W motor. Fully endorced by the "Juicer Master", Jason Vale, the unit comes with one of his books. It has a pulp container with a capacity of 1.5litres and all parts are dishwasher safe. You might wonder what this doesn't have that its big brother, the Philips HR1861, has. This unit is less powerful and has a smaller feeding tube so you need to cut the fruit first. Affordable, attractive and easy to use. If you want to dip your toe in juicing, this is a great place to start.